Since most dogs don't read, we've put together a selection of Two Dog gifts, many of which feature the wonderful dog art in our books or the work of dog artists we like. We'll be adding more throughout the year, so check back often to see what's new. While some companies sell &quotpet music" CDs, touting the soothing and comforting sounds of bland new age background music, we think dogs have better musical taste. So we've selected a couple of very special CD sets from Savoy Jazz that both you and your dog will enjoy:Jazz for a Rainy Afternoon and Jazz for When You're Alone. Both sets offer two CDs with more than 100 minutes of gently swinging jazz featuring well-known artists that will get your dog's tail sleep-thumping in no time. Woof! We no longer sell Savoy Jazz CDs in our online store. The last time we were in New Orleans, we "discovered" the work of artist Matt Rinard, who has a delightfully whimsical and wacky way of depicting the world of dogs and cats in his colorful art. We liked his style so much, we found ourselves ignoring the rest of the French Quarter and spending all our time in his gallery. We're pleased to offer you a few of our favorite Matt Rinard pieces on 100% cotton shirts. We think you'll enjoy his work as much as we do! Like our logo? Try one of our 100% cotton, Two Dog T-shirts. Hand silk-screened in downeast Maine, our shirts are Hanes pre-shrunk, heavy-weight Beefy-Ts (guess which dog picked that out). Our short-sleeved shirts are ash gray with the Two Dog Press logo in black and teal on the left breast. Brighten up a desk or coffee table with this colorful ceramic coaster designed to remind you of an adventurous water-loving dog -- and perhaps to prompt you to take that long-awaited vacation to your favorite island get-away. This ceramic tile is 4.25 x 4.25 inches with a cork back and features the canine protagonist from Rebecca Goodale's artist book: Island Dog. Woof! We are sold out of Island Dog coasters! Sorry! Treat yourself or a friend to an inedible biscuit pin, hand-crafted from stoneware clay in midcoast Maine, under the watchful eye of Cecil the dog. (Don't worry, most dogs show little interest in these 1.5 inch long biscuits once they discover they have no odor!) Mac and Maynard's mom always gets compliments when she wears her biscuit pin. The Maine Dog pins have a high-quality nickel pinback and are packaged in an individual giftbox with a decorative label and descriptive card insert. The Maine Dog pendants have brass hardware with a black leather cord and are packaged in an individual giftbox with a decorative label and descriptive card insert. You can easily adust the length of the cord to fit a child's neck. The Maine Dog magnets are individually packaged in a clear plastic bag with a label and descriptive card. Woof! The Maine Dog has gone out of business and we are no longer able to get these delightful magnets. Sorry! Artist Greg Dearth's love of dogs and background as a wood-engraver shines in the exquisite detail of his illustrations. These delightful prints, originally created to accompany selections in our award-winning book, Cooking with Dogs, offer amusing and heartwarming images of dogs squeezing into puppy-sized spaces, begging for attention, or being led by their nose. We spend a lot of time looking for fun and unusual dog cards, and these animal art cards by Ann Davis of Montpelier Vermont are among our favorites. The sweet, quizzical, expressive faces of "Lucy" and "Blue Dog" make perfect thinking-of-you cards. "Noodle" is ideal for a birthday or party card. And "Dearest" is a delightful image to show a fellow dog person you love them. Whether you want to include a special card with a gift or just drop a note to a friend, we think you'll find an Anne Made card that matches your mood or fits the occasion. 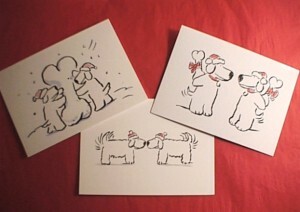 We like Mary Ross' little dog "icons" so much we asked her to illustrate our holiday cards. "Snow Bones" captures two dogs making winter holiday lawn art and is blank (no greeting) on the inside. "Season's Greetings" shows two dogs sniffing and wagging hello; the inside reads "Hope your holiday smells wonderful." "Bone for the Holidays" features two dogs standing face-to-face, each smiling sweetly with a large bone wrapped with a red bow behind his back. The inside greeting reads: "Bone for the Holidays." These 5x7 cards are available in boxed sets of 12 cards and envelopes or packaged individually in a clear plastic jacket with a 1.5 x 3 inch gift label. The gift label shows a patiently waiting dog next to neatly wrapped present, with space for you to write who the gift is to and from. These sets of 12 cards and envelopes are sure to make the people on your holiday card list smile. "Snow Bones" has two dogs making a unique form of holiday lawn art and has no greeting on the inside. "Season's Greetings" shows two dogs sniffing and wagging hello; the inside reads "Hope your holiday smells wonderful." "Bone for the Holidays" features two dogs standing face-to-face, each smiling sweetly with a large bone wrapped with a red bow behind his back. The inside greeting reads: "Bone for the Holidays." These 5x7 cards are available in boxed sets of 12 cards and white envelopes.